Pest description and crop damage The flightless adult has a roughened hard-shelled appearance and is 0.5 inch long. Adult beetles are black with small patches of white scales on the forewings. The front of the head projects forward into a long, broad snout. Adults feed on foliage as well as any portion of the inflorescence or cluster rachis, especially just before unfertilized berries drop shortly after bloom. Berry and cluster stems (rachis) can be girdled, and primary buds and new shoots may be destroyed in early spring. 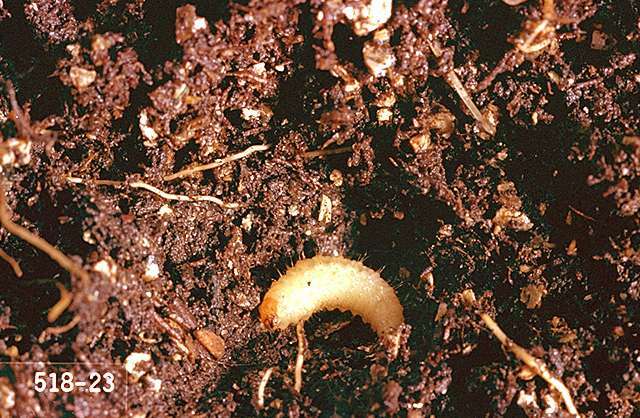 Larvae or grubs feed in the soil on the roots of the vine but cause no apparent damage. 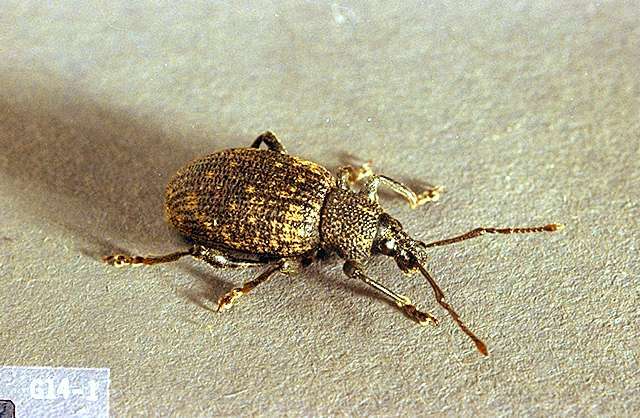 Black vine weevil can be a serious problem, especially in newly established vineyards, but damage is usually sporadic. Biology and life history Black vine weevils overwinter in the larval stage. Larvae pupate during April and adult beetles emerge in May and June. All black vine weevils are female and lay their eggs in the soil. Egg laying begins 2 to 3 weeks after emergence and continues for 6 to 8 weeks. 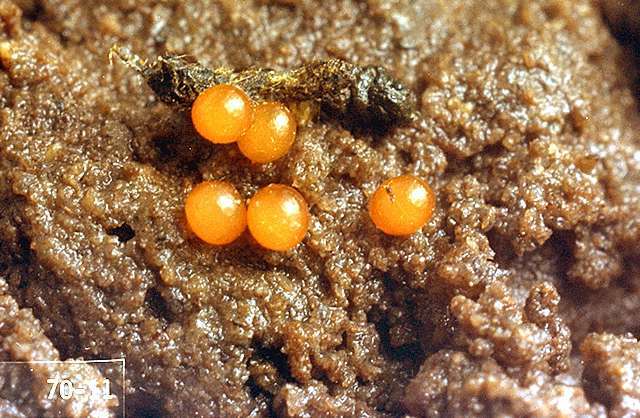 A single female may lay 500 eggs. Sampling and thresholds Monitor adults with cardboard traps. Vine trunks should be stripped of loose bark and corrugated cardboard traps should be wrapped around it. During the day, adults hide between the wrap's corrugations and the smooth trunk. The cardboard traps can be removed and inspected to determine presence of the pest. No information is available on threshold levels. Little is known about biological controls, but it is estimated that many larvae fall prey to predatory beetles, entomopathogenic fungi, and nematodes. Cultivation around the base of vines in spring (April) is destructive to pupae as they are developing. pyrethrins-Some formulations are OMRI-listed for organic use. azadirachtin (Aza-Direct, Neemix and other brands)-Rate varies with specific product; consult label for the correct rate. Apply foliar sprays to control adult feeding, and soil drench for larval stage. Some formulations are OMRI-listed for organic use. bifenthrin (Brigade and other products) at 0.10 lb ai/a. PHI 30 days. Group 3A insecticide. Restricted use pesticide.